Pledge Drive Show: Donate to KUSP and learn about Stem Cell Meat, Google’s self driving car, Measles on the rise, an astroid that will not kill us – and Reading Rainbow is back! Bonnie’s suggestion for a pledge drive: Contribute to it! Directed by Carroll Ballard (Never Cry Wolf, The Black Stallion), The Hello Machine is a short, wordless film-poem, in which he chronicles the building of an entire ESS Mainframe. It’s one of the best films in the AT&T Archives, a poetic musing on the connections between handwork and the act of communicating. In the film, he chronicles the act of making and building the mainframe with human hands so carefully that it becomes a handcraft, like weaving or sewing. As he elevates the frameworker to the status of craftperson, the mainframe itself becomes an artistic masterpiece, then brought to life by electricity. Ballard’s stance is that it takes humans to connect humans, not machines. bq.So far this year, 288 cases of measles in the United States have been reported by the Centers for Disease Control and Prevention (CDC). bq.288. And mind you, that’s only through the first five months of the year (to May 23). This number is already higher than the total cases reported for any year going back to 1997 (and that includes last year, when the cases were triple their usual average). There haven’t been this many cases by this time of the year since 1994. Twenty years ago. bq.Why the sudden spike? Unvaccinated people. The pay gap between college graduates and everyone else rose to a record high last year, suggesting there are too few graduates. bq.Reading Rainbow’s digital collection already contains hundreds of books and video field trips… but with your help, we’ll be able to make the Reading Rainbow library available on more of the devices modern kids use to consume content. Now that we’ve met our initial goal of $1,000,000, we will be able to launch a new version of Reading Rainbow on the single most-used digital platform: the web. But when we reach our next goal of $5,000,000, we’ll also be able to bring the service to mobile phones, Android, game consoles like XBOX and PlayStation, and set-top boxes like AppleTV and ROKU. Caption: The left column shows the stepwise increase in cell-culture volume, starting with a vial from the working cell bank (note that a new working cell bank is made from a vial from the master cell bank). Exponentially growing cells from each step serve, after growing to a certain cell density, as the inoculum of the next culture vessel, which is an order of magnitude larger. The final bioreactor starts only partially filled and is fed with sterile medium at such a rate that the cells grow further under optimal conditions. 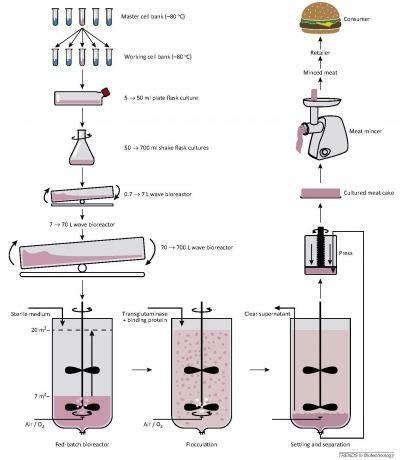 When the bioreactor is full and the desired cell density is reached, the protein-crosslinking enzyme transglutaminase and binding protein are added to induce the formation of easily settling aggregates of cells, which quickly settle when stirring is stopped (bottom right). The harvested cells are pressed and the cake is extruded into retailer- and/or consumer-size portions of minced meat (right column). Credit: Trends in Biotechnology, van der Weele et al.